The first thing I took a picture of was my front brake. You can see the rotor is warm from the braking into the driveway. In the last 1/4 mile of my way home, I brake from 40 to 25, along with the final stop into the garage. In my ICE powered car, I can't touch my brakes when I park, but the Leaf's regenerative braking recovers most of the stopping energy back into the battery. #1 - The photo below is a shot of the left side of the engine bay. The hottest thing in the photo is a relay labeled "PBW SSOFF" in the upper left...it looks like a dot in the photo. I took the cover off the relay and it was 141F...seems odd, but seems designed to handle the heat since it was solid (not soft, warped or discolored after 1y/12Kmi). That's the issue with "seeing" something in infrared for the first time...you don't know if it's broken or normal. #2 - The photo below is looking down onto the electrical motor/transmission itself. You would think this would be the hottest part of the engine bay, but in this photo, the hottest part is 110F. This is the right end of the assembly which is mostly the transmission housing. I couldn't get a good shot of the motor housing since there were hoses in the way. 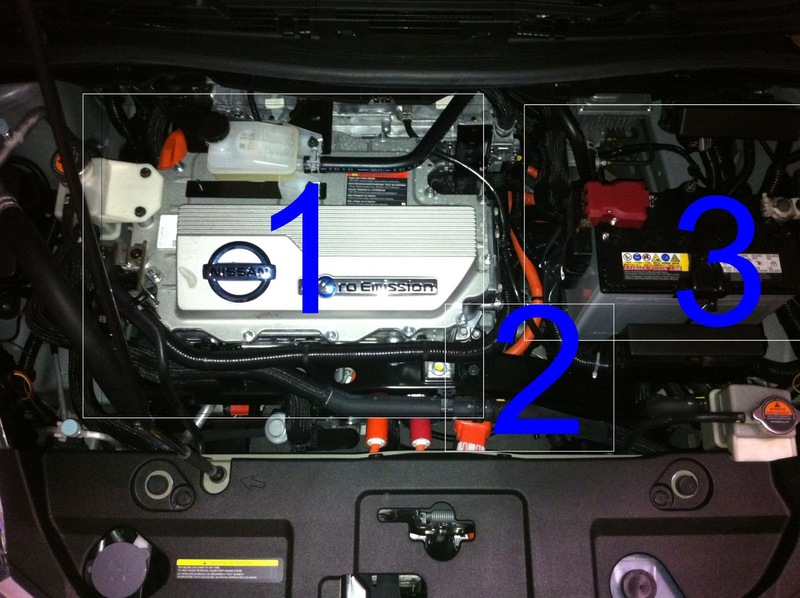 #3 - In the photo below, you can see the right side of the engine bay. The battery is in the middle of the picture. Like in photo #1, the hottest part is a relay in the upper right. Taking the cover off shows a relay labeled "M/C" at 105F. As you can see by these few infrared photos, the Leaf is a pretty cool car to drive (ha!). This also translates into slightly lower home A/C cost for me since I no longer park a very hot car in my attached garage. I wanted to do a side-by-side comparison with an ICE powered car to show the difference in waste heat, but I didn't have the time with the camera. It would have also been nice to put the car on a lift and shoot the motor from below. Maybe this would be a good project for a school to do? Cars driving AWAY from me on the Interstate driving 70 mph. I'm on a bridge above traffic. You can easily tell where the exhaust pipes are! Cars driving TOWARD me on the Interstate driving 70 mph. I'm on a bridge above traffic. Even at 70mph, you can see the heat reflecting off the road from the very hot engine. The photo below was at a major intersection at night. You can see where cars queue up for the light. Here's a car that just stopped from a 35mph speed limit road. You can easily see the hot brakes and engine radiating from the road...but you can also tell the car hasn't been "on" too long since the hood is just starting to heat up. The disk brakes are probably much hotter than the indicated 131F since I was so far away (accuracy decreases with range). Trees in the forest just after dark. My Feet! You can see my prior steps to the right of my feet. Disclaimer: I did not adjust for emissivity for each photo...all of these photos were taken at .98. This means the scale on the right of the photos may not be correct. If you know what your doing, I could share the native Fluke files so you can school me...see the About page for contacting me. Here's a "cool" picture of the electric bike from my trip after a dyno run and it shows how in comparison the motor is one hot mama! Wow! great illustration of just how efficient the LEAF is. One thing that I noticed right away (besides the lack of smell) is how much cooler the garage remains in Summer after parking the LEAF. I used to leave the garage door open for 30 minutes with my Prius partly because of smell but mostly because of the heat! Perhaps various car dealer companies should perform this kind of check up on the cars they are selling. Just, you know, to make sure that everything is safe and fine even if the car is said to be used already. I am delighted that this kind of technology came to play. Having an assessment couldn't be more easier. It would both benefit the buyer and also the manufacturer. Thermal cameras are indeed great help for our daily lives. We can determine the heat levels of an object just by taking photos. It lessens the risk of accidents and injuries that can occur when someone check heat levels. That is one cool engine. And with 60% efficency it does beat the old ice engines. However, the problem with EV is the availability of charging stations. Maybe in the future charging stations would be as common as gas stations. Nice experiment! Good thing you found a purpose for your thermal imaging camera. I was wondering how "efficient" Nissan Leaf is, but I've never thought of basing it on the heat (probably because I didn't know a way to do so). Thanks for this! This is cool, you can detect the efficiency of the car just by using your thermal camera! I hope I can do this to cars before buying them! Well, there's another argument for making more electric cars. Now if only they can also make electrical vehicle developments like that for motorcycles; we wouldn't be wasting so much energy on excessive heat. I want to try this Thermography test on one of Ford's Sedans. I like to see how efficient they are, because I wanna buy one, soon! I’ve been hearing a lot of positive feedback about this thermal camera and a lot of my friends recommend this thermography test to me. Well I think, this is somewhat cool but I do agree with Victoria, since it’s an EV car, they should provide enough charging stations for these cars. Nissan boss Carlos Ghosn is a French citizen. (He also runs Renault.) Far as I know, he's legal wherever he travels.